Whilst the civil strife ended some time ago, its impact continues to show its metaphorical scars in many different ways. Another direct impact of the war was the westernization of younger family members and the disintegration of the once customary extended family system. As a consequence, many of today’s elders are destitute and are experiencing poor health and living in difficult and solitary conditions. As reported in prior years, social support and security of the elders remain important issues in need of urgent attention. Sadly, this remains a deeply neglected area of societal need. At the Sivapoomi Elders’ Home (”Home”), 72 and67 elders were being looked as at 31 March 2015 and 31 March 2014respectively. The Home provides a comfortable environment offering physical and moral support, appropriately healthy diet and regular medical check-ups with in-house nursing care. During the period a new library facility was established at the Home to add to the elders’ in-house facilities. Recently, two new buildings were constructed to accommodate more elders. Day-by-day, needs and requirements are increasing, thereby resulting in an acute shortage of available space. 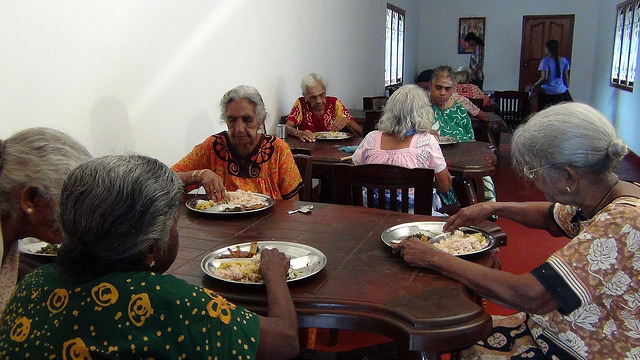 Nevertheless, our sincere gratitude to every one of the Trust’s donors for making the current outcome possible and thereby enriching the lives of the elders at the Home.